I have never been a fan of Agatha Christie’s 1946 novel, “The Hollow”. Many would find my opinion surprising, considering its reputation as one of the author’s best works and a fine example of the “country house murder” story. But I cannot help how I feel. I simply never warmed up to it. The 1946 novel eventually became a successful London play in 1951. 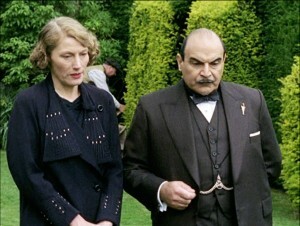 And in 2004, producers of the “Agatha Christie’s POIROT”series adapted the novel into a ninety-minute television movie in 2004, with David Suchet as Hercule Poirot. I have seen ”THE HOLLOW” at least twice. Yet, my opinion of the story has not improved one whit for me. I cannot say that the movie had a terrible story. The latter revolved around the murder of a successful and Harley Street doctor (in other words, expensive) named John Cristow, who specialized in disease research. The murder occurred at a weekend house party held by Sir Henry and Lady Angkatell at their estate called the Hollow. Dr. Christow was a brilliant and charismatic man who was having a passionate affair with his wife’s cousin, a sculptor named Henrietta Savernake. His plain and not so-intelligent wife, Gerda, was unaware of his affair with Henrietta. But she did become aware of his past with an actress named Veronica Cray, who found fame as a Hollywood star and was staying at a cottage on the Angkatell estate. And there were other members of the Angkatell family that became caught up in several affairs of the heart – like Edward Angkatell, a distant cousin of Henry and entailee of the family’s beloved house, Ainswick, who was in love with Henrietta. 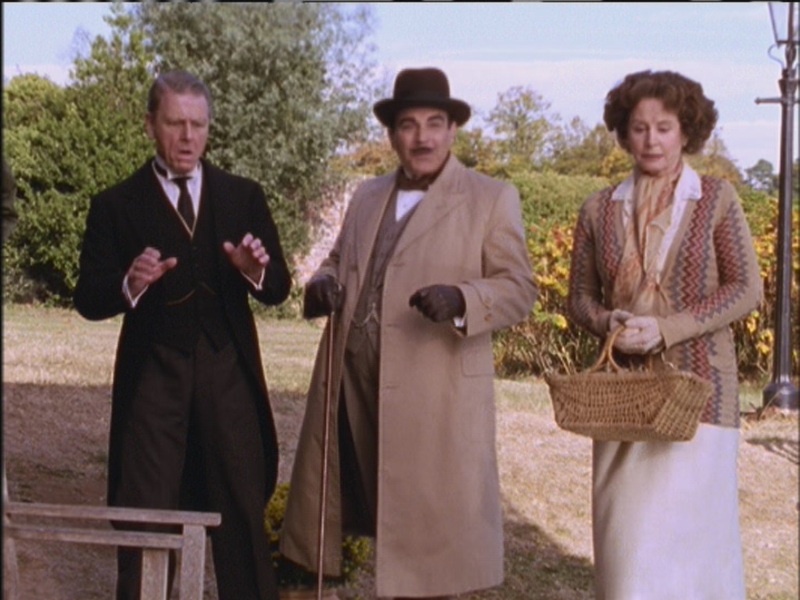 Also staying at another cottage on the Angkatell estate was Hercule Poirot, who was on hand to solve Dr. Cristow’s murder. As I had stated earlier, my opinion of Christie’s story had not improved after watching “THE HOLLOW”. What can I say? I found it difficult to care about most of the characters. Despite his intelligence and dedication to his profession, I never liked the John Cristow character. In fact, I rather despised him, which made it difficult for me to care whether his murderer would be caught. Only one of the main suspects was portrayed in an unsympathetic light. Yet, the character failed to distract me from my dislike of the other characters – save one. And even though the murderer’s revelation came via a double-bluff, I found the plot’s details difficult to remember to endure, let alone remember. Yeah, I disliked the story that much. Despite my dislike of “THE HOLLOW”, I must admit that it could boast some pretty good performances. I was especially impressed by Megan Dodds as Henrietta Savernake, Jonathan Cake as John Cristow, Claire Price as Gerda Cristow, and Sarah Miles as Lucy, Lady Angkatell. The one bad apple in the bunch turned out to be Lysette Anthony, who gave an over-the-top performance as Veronica Cray, Dr.Cristow’s former lover turned Hollywood starlet. 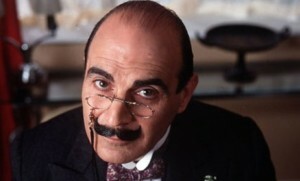 David Suchet did an admirable job as Poirot, but for once, his performance did not strike me as memorable. I have mixed feelings about the movie’s production values. Michael Pickwoad did a solid job with his production designs, even if James Aspinall’s photography did not do much justice to it. But Sheena Napier’s costume designs and the hairstyles left me feelings confused. Although Christie’s novel was published in the mid-1940s, this movie seemed to be set in the 1930s. Yet, there were times I could not tell via the costumes and hairstyles whether the movie was set in the 30s or 40s. Very confusing. When I saw “THE HOLLOW”, I had hoped my negative feelings toward Christie’s 1946 novel would change for the better. Unfortunately, it failed. Perhaps I might watch “THE HOLLOW” once a year in the hopes that I will learn to appreciate the story. Then again . . . perhaps not. 1. “Without a Clue” (1988) – I still love this spoof of the Sherlock Holmes stories in which the real detective is Dr. John Watson, who has hired an unemployed alcoholic actor named Reginal Kincaid to satisfy the public’s demand for a real Sherlock Holmes. In this film, the pair investigate the disappearance of Bank of England banknote plates and a printing supervisor. 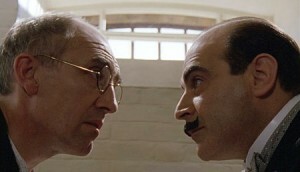 Michael Caine and Ben Kingsley are magic under Thom Eberhardt’s direction. 2. “Sherlock Holmes: Game of Shadows” (2011) – Guy Richie made this second film about the Sherlock Holmes character and the latter’s conflict with his worst nemesis, Professor James Moriraty and his attempt to stop a major assassination. I loved it even more than Ritchie’s 2009 film. 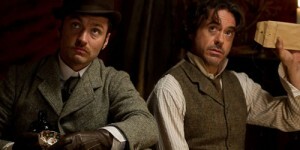 Robert Downey Jr. and Jude Law starred as Holmes and Watson. 3. “Sherlock Holmes” (2009) – Guy Ritchie’s adaptation of Doyle’s character about Holmes’ conflict against a nefarious aristocratic with plans to assume political control of the British Empire has become a major favorite of mine. Robert Downey Jr. and Jude Law, along with Rachel McAdams and Mark Strong star. 4. “The Adventures of Sherlock Holmes” (1939) – I am a big fan of this adaptation of William Gillette’s play about Sherlock Holmes’ investigation of a series of death threats against a well-to-do London family. This is the second film to feature Basil Rathbone and Nigel Bruce as Holmes and Dr. Watson. Directed by Alfred L. Werker, the movie co-starred Ida Lupino and George Zucco. 5. 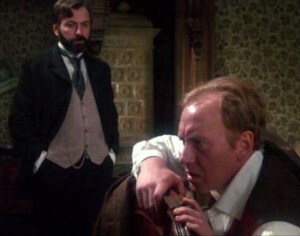 The Seven-Per-Cent Solution” (1976) – I have always enjoyed Herbert Ross’ adaptation of Nicholas Meyer’s 1974 novel about Holmes and Watson recruiting Dr. Sigmund Freud to guide the detective in overcoming his cocaine habit and investigate a nefarious kidnapping plot. Nicol Williamson, Robert Duvall, Alan Arkin, Vanessa Redgrave and Laurence Olivier starred. 6. “The Hound of the Baskervilles” (1939) – This is my favorite adaptation of Doyle’s novel about Holmes’ investigation of an English family’s connection to a “demon” hound and a Candandian heir to the family’s fortunes. This is the first film to feature Basil Rathbone and Nigel Bruce as Holmes and Dr. Watson. Sidney Lanfield directed. 7. “Young Sherlock Holmes” (1985) – Steven Spielberg produced and Barry Levinson directed this fanciful imagining of Holmes and Watson’s first meeting as adolescents at a prestigious boys school, as they investigate a series of suspicious suicide deaths. 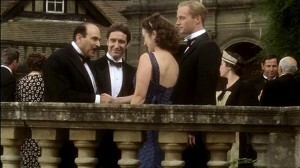 Nicholas Rowe, Alan Cox, Anthony Higgins and Sophie Ward starred. 8. “The Hound of the Baskervilles” (1988) – This is my favorite adaptation of Arthur Conan Doyle’s Sherlock Holmes novels featuring Jeremy Brett as the detective. 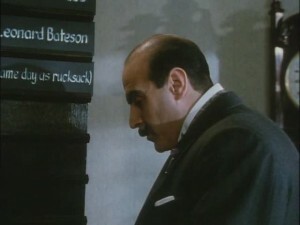 Edward Hardwicke co-starred as Dr. Watson. The movie was directed by Brian Mills. 9. “Murder By Decree” (1979) – Directed by Bob Clark, Holmes and Watson investigate the Jack the Ripper murders. Excellent, although a bit bloody for my tastes. Christopher Plummer and James Mason co-starred as Holmes and Watson. 10. “The Private Life of Sherlock Holmes” (1970) – Billy Wilder directed this tale about a bored Sherlock Holmes, who eagerly decides to investigate the attempt on the life of a woman with a missing identity. Robert Stephens and Colin Blakely starred in this entertaining, yet flawed movie. With Guy Ritchie’s recent Sherlock Holmes movie a big hit and a sequel due to be released in theaters this Christmas, I had decided to watch another Holmes film called ”WITHOUT A CLUE”. Directed by Thom Eberhardt, the movie has the distinction of turning the Sherlock Holmes mythos on its ear by presenting a premise similar to the 1982-1986 NBC series, ”REMINGTON STEELE”. Ben Kingsley portrayed Dr. John Watson, a late 19th century physician who had been forced to hide his talent as a criminal investigator by creating the fictional character, Sherlock Holmes, while applying for a position at a conservative hospital. Watson failed to gain the position, but managed to solve a crime. To get close to the crimes that came under his notice and satisfy public demand to see Holmes in person, he hired an alcoholic unemployed actor named Reginald Kincaid – portrayed by Michael Caine – to play Holmes. 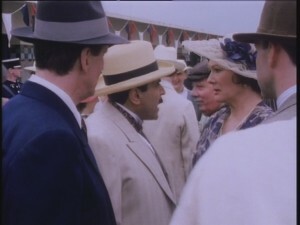 The movie opened with Watson and Kincaid helping the envious Inspector Lestrade (Jeffrey Jones) and Scotland Yard solve an attempted robbery at a local London museum. By this time, Watson and Kincaid had been engaged in their deception for nearly a decade and the two have become increasingly weary of each other. But the disappearance of Bank of England £5 banknote printing plates and the printing supervisor Peter Giles (John Warner); along with the destruction of a paper mill by fire forced the pair to continue their deception once more. Their investigation led to a major counterfeiting case that threatened to disrupt the British Empire’s economy. I suspect that ”WITHOUT A CLUE” might not be to everyone’s taste. The movie’s style of humor closely resembled that from the late Victorian/Edwardian music halls. Because of this, the humor ended up being considered flat or incomprehensible to some. I, on the other hand, loved ”WITHOUT A CLUE”. Not only did I appreciate the director and screenwriters’ attempt to compliment the movie’s style with its late Victorian setting; I also liked the fact that the setting also embraced the movie’s style of humor and dialogue. To be honest, I suspect that the humor might be late 20th century, but presented in a late Victorian theatrical style. More importantly, I feel that screenwriters Gary Murphy and Larry Strawther had created a first-rate story in which Watson and Kincaid set out to solve the disappearances of the banknote plates and Giles. The story is filled with exciting action that included two shootouts, a major fire, an attempted kidnapping, deception, attempted murder and murder. At least twenty minutes into the movie, the script revealed the perpetuator behind the story’s series of crimes. And yet, it still managed to deliver a number of surprises that proved to be both ominous and hilarious. 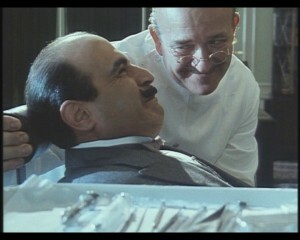 It seemed a shame that Michael Caine and Ben Kingsley had never worked together again (unless I am proven wrong). The two actors produced such a marvelous screen chemistry that left me in stitches. Caine’s sly and hilarious portrayal of the alcoholic and womanizing fake Sherlock Holmes seemed like a perfect contrast to Kingsley’s uptight and long-suffering Dr. Watson. 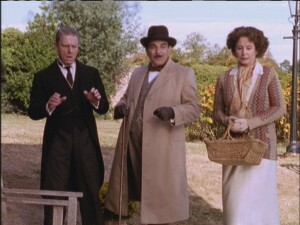 The two leads were ably supported by the very American Jeffrey Jones, who portrayed the pretentious and envious Inspector Lestrade; Lysette Anthony as the resolute, yet passionate daughter of the missing Peter Giles; Pat Keen as Dr. Watson’s loyal and very proper housekeeper, Mrs. Hudson; Matthew Savage as Dr. Watson’s young and intelligent assistant and leader of the Baker Street Boys; and Nigel Davenport, who portrayed the very aristocratic Chancellor of the Exchequer, Lord Smithwick. Paul Freeman, who became known as Indiana Jones’ arch-nemesis Rene Belloq, portrayed our heroes’ nemesis, the ruthless and intelligent Professor James Moriarty. What I especially enjoyed about Freeman’s performance was his elegant take on the role. Although a fun and entertaining movie, ”WITHOUT A CLUE” does have its flaws. The movie’s Victorian style humor did come off as somewhat stagy in the first ten to fifteen minutes. 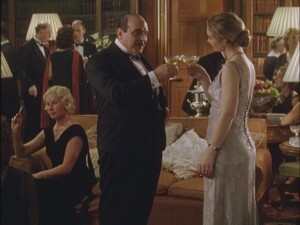 This was especially apparent in the sequence that revealed Watson and Kincaid’s lifestyle at Watson’s home on Baker Street. At times, I felt as if I had been watching a stage play. And just before the final showdown, the pacing became so slow that it threatened to drag the movie. The heroes had just suffered a major setback in the case. They spent the period leading up to the finale, trying to figure out their next move. Despite this segment’s short running time, the movie’s slow pacing during this period nearly led me to fall asleep. As I had earlier stated, ”WITHOUT A CLUE” might not be for everyone. Some may not appreciate both director Thom Eberhardt and the screenwriters’ efforts to blend its Victorian setting a music hall style humor. However, I found the humor both sly and hilarious. And along with some great action, a story filled with plenty of twists and a first-rate cast led by Michael Caine and Ben Kingsley, I would highly recommend it.